Be the first to share your favorite memory, photo or story of Alphonsine. This memorial page is dedicated for family, friends and future generations to celebrate the life of their loved one. Alphonsine W. Kolz, nee Hemlin. July 15, 2018. Age 85. Of Kankakee, IL., formerly of Lemont, IL., and Chicago’s Marquette Park neighborhood. Loving aunt of Lee(Barbara) Welsh and Laura(Timothy) Rollins and families. Preceeded in death by her sister, late Bernadette(William) Welsh and brother, late Kevin(Evelyn) Hemlin. Visitation Friday 6:00 to 8:00 P.M. at the Petkus Lemont Funeral Home, 12401 S. Archer Ave.,(at Derby Rd. ), Lemont. Committal services are private. Alphonsine was a former member of the Lemont V.F.W. Post Ladies Auxiliary. To send flowers or a remembrance gift to the family of Alphonsine W. Kolz, please visit our Tribute Store. 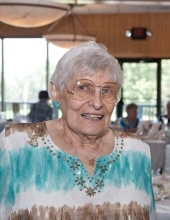 "Email Address" would like to share the life celebration of Alphonsine W. Kolz. Click on the "link" to go to share a favorite memory or leave a condolence message for the family.